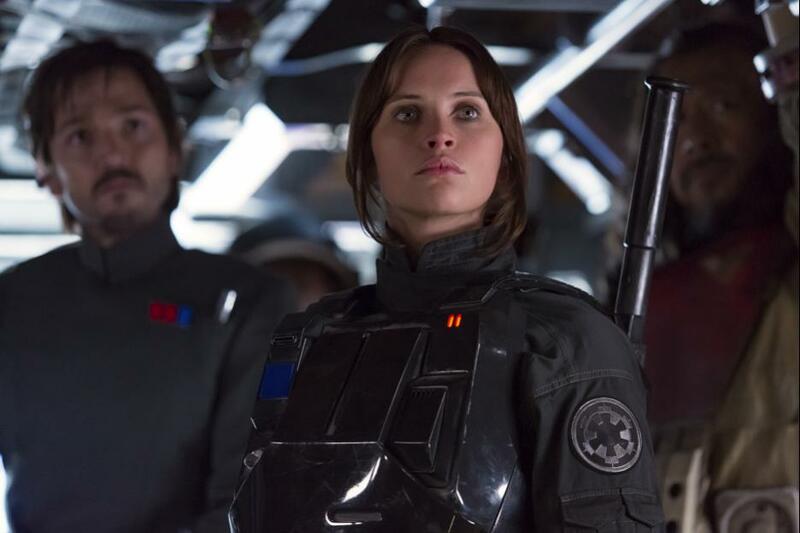 There are going to be three main things discussed about Rogue One when it comes out. How does it compare to The Force Awakens? What up with them reshoots? And why in god’s name would you resurrect the dead like that? My thoughts on each pertain to my overall feelings about the latest Star War, so I’ll address them directly and proceed from there, middle-out style. This will sound wishy-washy, but some aspects of Rogue One are much much better than The Force Awakens, and vice versa. It’s a bit of a draw. Rogue is bound by its very nature as a prequel, but Force is trapped with the original cast. They both wink at the original film too much, but I think Rogue’s nods are organic asides, meanwhile in Force they are the bones the film is built upon. Rogue isn’t repeating history, it’s Rosencrantzing it. TFA’s biggest strength is the new characters. They’re fresh, fun, have great chemistry, and you can’t wait to see where they’ll go next. In Rogue the characters aren’t bad, they’re just not as fleshed out. The talented cast makes up the difference, but you'll still wish they went deeper. Which leads me to the reshoots. So much was made about the reshoots, and I ignored the noise as best I could knowing that it’s a typical thing in film production and historically doesn’t determine good or bad movies. But after seeing the finished film, and rewatching the trailers (also understanding trailers use alternate takes and unfinished efx shots all the time), it’s hard not to make a few conjectures. Even without knowing about the reshoots or seeing so much from the trailers missing, the stitching in this film is noticeable. There are some setups with no payoffs. There are character beats that feel incongruous. There are just a few too many moments that feel shuffled in from somewhere else. It’s possible these are just script problems, but I’m wagering they go hand in hand. It has the seed of a great idea, but it feels like they didn’t know how they wanted to reverse engineer it, hit some bumps along the way, and more than likely salvaged as best they could. Which could explain the biggest WTF? in recent film history. Peter Cushing, who originally played Grand Moff Tarkin, has been brought back to life with visual effects to be in this movie. It’s baffling and it makes sense. It’s ridiculous and impressive. It’s ballsy and probably unethical (who am I to judge?). He had a major role in the original, so I guess they couldn’t figure out a way around including him. But why not just recast a lookalike? Could no one pull it off? Or if you must defy nature, do so sparingly. A line or two at most. But no, he has more dialogue than some of the characters on the poster. They do the same thing with a different character, but it works better because it’s only for one line (and the actor is still alive). But zombie-Tarkin is in at least 3 full scenes, walking, talking, and causing SAG years of headaches. It’s jarring at first, and at times the effect seems like it’s working, but then you start thinking about how they did it and it ultimately feels like a distraction. A Jurassic Park quote about could and should comes to mind. Fortunately, despite the seams showing, and the grave robbing, the film really moves. It gets better the closer the film gets to its final destination. There’s a lot of fun throughout meeting new creatures and visiting new planets, and once the contortions are complete the film is free to soar. The last section is some of the best filmmaking in the entire series. I really dug the way everything started to fall together like dominoes. It’s how the film rises above most prequels. It knows you know the ending, but it adds urgency and sacrifice to the familiar. And finally, director Gareth Edwards knows scale and knows how to make grandiose movies even if things are lacking elsewhere (coughGodzillacough) . This is one of the best looking films of the year, full stop. I can forgive a lot when so much looks this good, sounds this amazing, and finishes this strong. It’s clearly a film that’s going to be debated for a wide variety of reasons, but, like TFA, I’m going to remember the highs far more than the lows.